It’s very quaint and less affected by the cruise boat tourist trade and caters more to the sailing crowd. Very different atmosphere. We didn’t spend a lot of time there but it would be a place we’d go again on the next visit. Yes, we’re already thinking about the next visit. We decided to be adventurous and rent a Jeep for a self-guided island tour. Driving is on the left here and I only had to remind FM a couple times. The roads are hilly, narrow, steep and have hair-pin turns every 100 feet or so. The maximum speed limit on the island is 20 miles per hour with several sections at only 10mph. Annaberg Ruins are located at the northeastern end of the North Shore Road and this is where they made rum, sugar and molasses in the 18th and 19th Century. The hill was named after the plantation owner’s daughter, Anna. 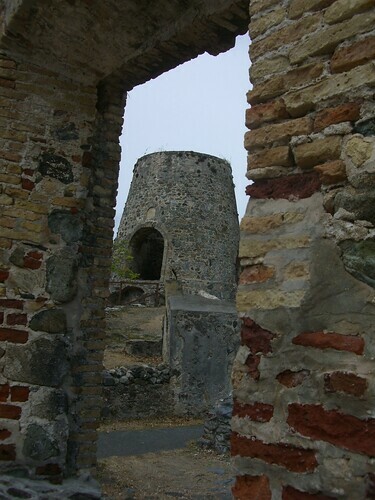 The windmill of the plantation (see photo above) was the tallest of the 5 windmills on St. John. 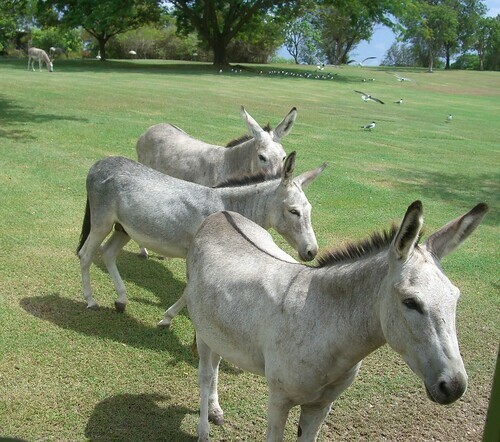 When we toured the area, it was already hot and humid which made me think of the poor slaves and the beasts of burden (mules, horses and donkeys) who were the backbone of the plantation. How awful it must have been to work in such abhorrent conditions. 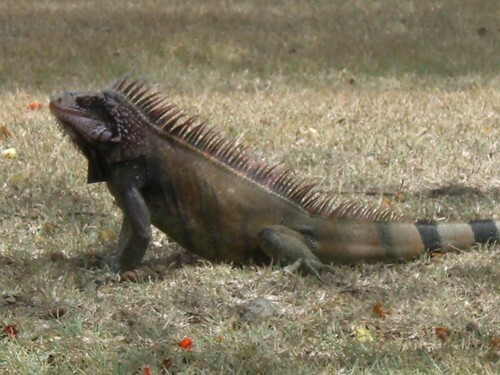 An employee told us he has a much bigger brother living outside the cottages just up the hill. We’ll have to check for him tomorrow. St. John has so many beautiful beaches so we needed to go to at least two a day just to get our fill. 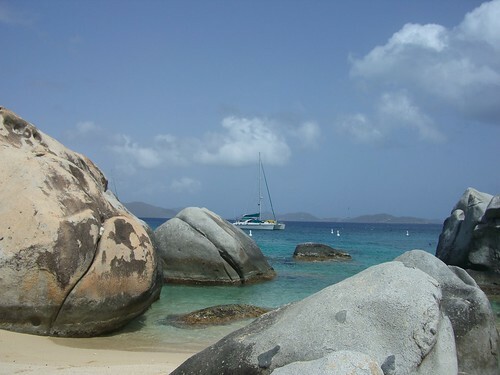 We took a break from St. John beaches to visit Virgin Gorda in the British Virgin Islands. Virgin Gorda is much more dry than St. John ~ complete with cactus plants. We walked around the property which took all of 10 minutes then headed to the beach. The fish were very friendly, almost playful. A couple photos of the ABOSOLUTELY GORGEOUS Little Dix beach! Yesterday, we took the weekly ferry from Caneel Bay to Virgin Gorda in the British Virgin Islands. This is a day trip which leaves at 8am and returns at about 4pm The boat trip was about an hour and a half &, along the way, we were able to see Tortola, Norman Island, Peter Island, Salt Island, Cooper Island, and Beef Island. The Caribbean is littered with these wonderful drops of land. As a teenager, we lived in Puerto Rico and the resorts where my dad worked had two sister properties: Caneel Bay and Little Dix Bay. 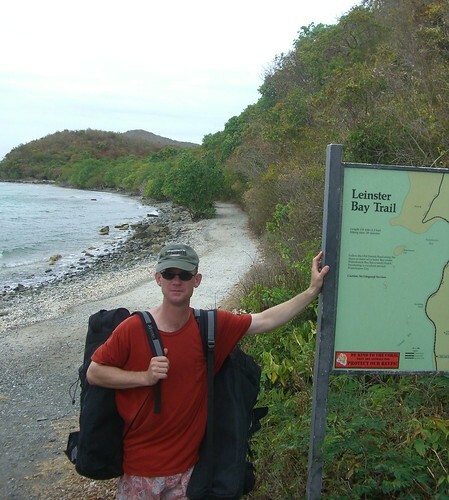 I was fortunate enough to spent time on both St. John and Virgin Gorda visiting friends of my parents. 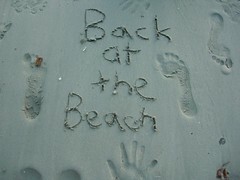 I would babysit for their children and during my off-duty time, I went to the beach, played tennis and enjoyed the area. 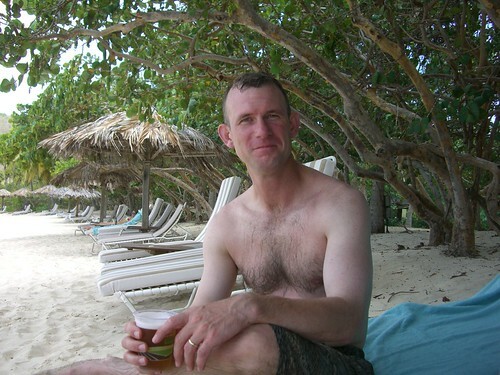 As you can see, my love of islands comes from my parents. This trip was planned so I could show FM and FG this beautiful part of the world. For me, it’s a little strange because most things are the same and feels so familiar but, then again, after so many years, a lot of changes have occurred. 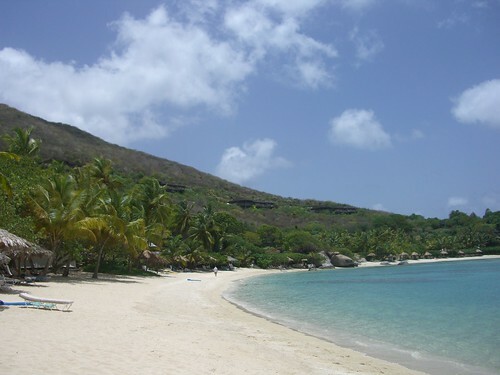 Virgin Gorda is still as beautiful as ever but has a lot of new construction and additions. The boat landed at the dock, we went through immigration which is where I got another passport stamp, then we headed about 1.2 miles by taxi to The Baths. 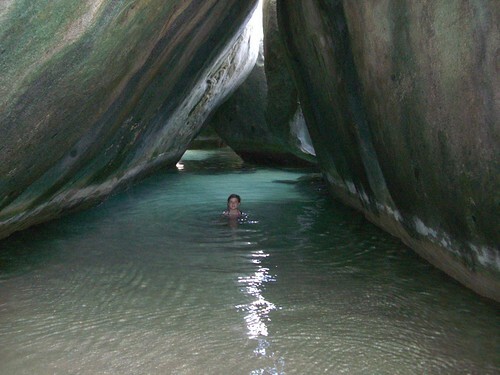 At the Baths, there are several big boulders leaning against one another and water flows in-between creating a very interesting hike and swim area. There’s also a beautiful bay at The Baths to swim and snorkel in ~ unfortunately, there were a ton of other “daytrippers” attempting to enjoy paradise. And the jelly fish decided to make it an adventure in pain for all of us. Fortunately, we all saw several jelly fish floating but we all managed not to get stung. We surely are in a beach lover’s paradise. 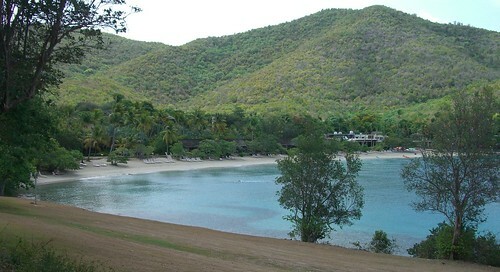 Caneel Bay is a beautiful resort which blends in with the natural surroundings of the island. Built in 1956, it’s a classic and traditions run deep with guests still dressing up for dinner, not wearing their swimsuits to meals and the number one priority here is relaxing. There are no phones or TV in the rooms which I love so much!! But never fear, there’s WiFi. Families come to visit year after year. 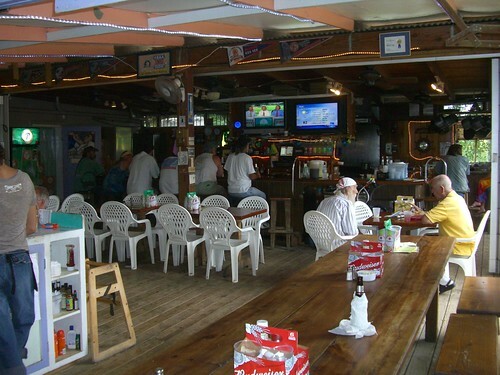 I met a couple at the beach bar celebrating their 30 year anniversary ~ they’d come to St John for their honeymoon in 1978. 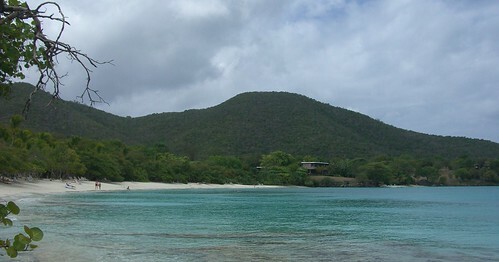 Caneel Bay has seven beaches on the property. 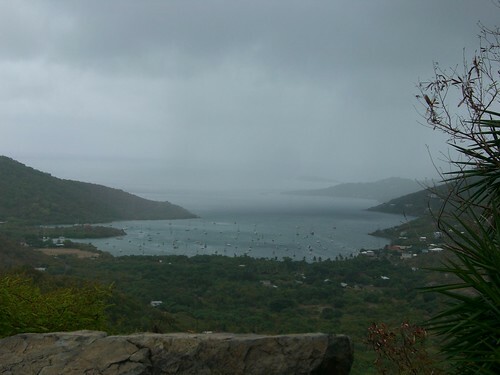 We swam at the beach outside our room, Caneel Bay Beach, and then we went to Hawksnest Beach for a snorkel and swim. At all the beaches, there are hammocks, lounge chairs and floats. After all our beaching, we were hungry for a good meal. We caught a cab into Cruz Bay which is known as “Love City” ~ a quirky but fun little town. We made it back to the beach today ~ we’re in St.John, US Virgin Islands. It’s paradise and we’re all so happy to be here but both FG and FM are asleep already and I’m right behind them. It took 3 flights and a boat ride for us to get here. It was so worth it.